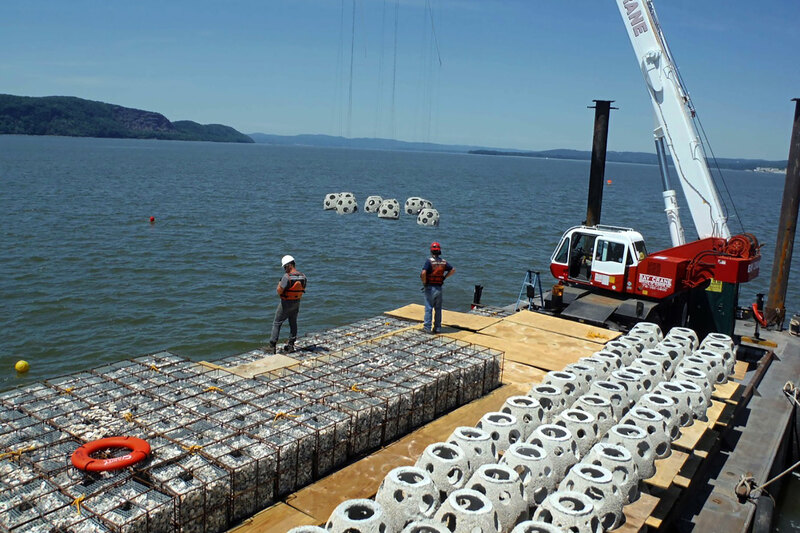 Following the results of a pilot study in 2015, the project team recently placed more than 400 oyster reef structures in the Hudson River near the Governor Mario M. Cuomo Bridge. The new oyster reef system covers more than five acres in the river, and is part of the state’s commitment to re-establish the local wild oyster population. The oyster working group included Hudson Riverkeeper, Scenic Hudson, NY/NJ Baykeeper, Cornell University, the National Oceanic and Atmospheric Administration, the Federal Highway Administration and the New York State Department of Environmental Conservation. In 2015 Reef Ball Foundation and Reef Innovations were at the Metropolitan Waterfront Conference. It was great seeing all the progress and plans for restoration of the New York Estuary.